The IT industry has grown significantly from the past few years on account of increasing investments and continuous researches in the field of technology. Globally, population is shifting towards high-end gadgets due to rise in personal disposable income. This tech savvy population further increasing the demand for Chatbot and pushing the various industries to adopt Chatbot for the customer service. Small & Medium-sized enterprises are shifting towards conversational interface systems which are available with chatbots. Moreover, B2B chatbots as SaaS (Software as a Service) model are adopted in numerous end-use industries to operate efficiently. Technology giants are spending huge capitals on the development of vertual assistants in order to exploit market opportunities, which is likely to impel the growth of chatbots market in coming years. 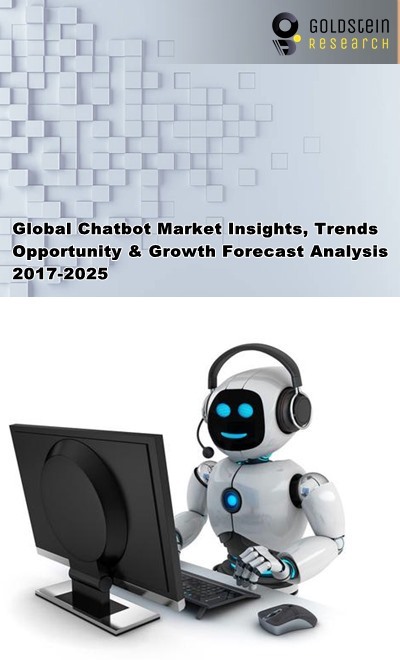 Goldstein Research analyst forecast the global Chatbot market to expand at a CAGR of 24.5% during the forecast period 2017-2025. Further, the market is anticipated to reach USD 834.5 million by the end of forecast period. Based on organization type, standalone chatbots accounted for the highest market share of 64.5% in 2016 and will continue to dominate the market during the forecast period. On the other hand web-based Chatbot market is projected to witness fastest growth at a CAGR of 36.6% over the forecast period as growing economies are shifting towards the advanced connectivity services such as e- alerts and e-reminders. Geographically, North America dominated the global Chatbot market with more than 48% market share. On the other hand, Asia Pacific chatbots market is also projected to demonstrate a highly promising CAGR over the forecast period. On the other hand, rsising internet penetration in underdeveloped regions of Asia Pacific and Middle East & Africa region with growing sales of smartphones will further supplement the growth of chatbot market. According to our global Chatbot market study on the basis of extensive primary and secondary research, one major trend in the market is growing adoption of artificial intelligence(AI) based chatbots in various industries as these bots are able to answers complex queries and responds more effectively. It is anticipated that AI and AI-driven chatbots will play a significant role in assisting users in the future. Big technology companies such as Amazon, Facebook, Google, IBM and Microsoft, as well as smaller technology companies, are all developing general-purpose solutions that organizations can implement to power their own AI driven structures. According to the report, major driver in global Chatbot market is growing applications and solutions to facilitate customers. Various e-commerce industries are adopting Chatbot for marketing and sales purposes which further impact positively on the revenue of this industry. These Chatbot are also used to assist and solve queries of the customers. Travel, hospitality and finance sectors are actively adopting chatbots to provide enhanced services to their customers, with companies such as American Express and Dutch Airline KLM are among the first few companies in these industries to launch messenger chatbots for customer service. Further, the report states that one challenge in global Chatbot market is managing cyber security. Privacy and safety factors are some of the major factors which are restraining the market of chatbot globally. Moreover, app-based human interaction platform is reluctant by users due to presence of cynicism related to privacy of data. These factors are hampering the growth of global chatbot market. The report covers the present ground scenario and the future growth prospects of the Chatbot market for 2017-2025 along with the total revenue of Chatbot industry in every region. We calculated the market size and revenue share on the basis of revenue generated per segment, regional and country level. The revenue forecast is given on the basis of number of Chatbot companies and current growth rate of the market. Global Chatbot Market Outlook 2017-2025, has been prepared based on an in-depth market analysis from industry experts. The report covers the competitive landscape and current position of major players in the global Chatbot market. The report also includes porter’s five force model, SWOT analysis, company profiling, business strategies of market players and their business models. Global Chatbot market report also recognizes value chain analysis to understand the cost differentiation to provide competitive advantage to the existing and new entry players. Our Global Chatbot Market report comprises of the following companies as the key players in the global Chatbot market: Apple, Google, Samsung, Microsoft, Amazon, Facebook, Baidu, Kik, WeChat, Babylon Health, Haptik, Inc., Pandorabots, Inc., Slack Technologies, Inc. and SRI International.